This is my review of the IHG Rewards Club Premium Mastercard credit card. The representative APR is 41.5% variable, including the annual fee, based on a notional £1,200 credit limit. The IHG Rewards Club Premium Mastercard card is issued by Creation Financial Services (part of French bank BNP Paribas) and earns points in IHG Rewards Club. IHG Rewards Club is the loyalty scheme for Holiday Inn, Holiday Inn Express, Crowne Plaza, InterContinental, Kimpton, Indigo, Staybridge Suites and Candlewood Suites. There are two versions of this card. I reviewed the free IHG Rewards Club credit card here. The Premium card is a far more interesting proposition, especially if you are a high spender. What is the IHG Premium credit card sign-up bonus? You will receive 20,000 IHG Rewards Club points when you spend £200 within three months. This is worth 4,000 Avios or other airline miles if converted directly although you are better off using the points for hotel stays. 20,000 points is usually enough for a free night in a Holiday Inn or Holiday Inn Express in a provincial city, although most big city properties will be 25,000+. IHG Rewards Club runs regular PointBreaks promotions where rooms in 150 hotels worldwide are reduced to just 5,000 to 15,000 points per night. The sign-up bonus would get you up to four free nights if you redeemed it during one of these promotions. The IHG Rewards Club Premium Mastercard gives you a voucher for a free night at any IHG Rewards Club property when you reach £10,000 of spending per card year. You get this every year. This is a very impressive benefit. Use your voucher at an InterContinental in London, Paris or New York and you will be getting a £250+ room. You need to offset the value of this against the £99 card fee of course. However, £250 less the £99 fee still represents a 1.5% return on £10,000 of spending – and that is before you factor in the value of the standard points on your spend. You will only receive the voucher at the end of your card year irrespective of how quickly you hit the £10,000 target. This article explains the process for cancelling the card if you do not want to renew for another year but are still owed a voucher. You will receive IHG Rewards Club Platinum Elite status for as long as you hold the card. Platinum is the middle tier in IHG Rewards Club following the launch of the new Spire Elite card. There are no major guaranteed benefits (no free breakfast, no room upgrade). You can see the list of Platinum Elite benefits here. Some hotels – especially Crowne Plaza hotels – do choose to give Platinum holders decent recognition, including upgrades, lounge access and late check-out. You also receive a 50% base points bonus on your stays. Your on-going points earned from using the card – but not the sign-up bonus – count towards IHG Rewards Club status. This will help your progression from Platinum Elite to the top tier Spire Elite status. Note that the sign-up bonus does not count towards status. What are the conditions of applying? There is a minimum income requirement of £10,000. What is the IHG Premium credit card annual fee? There is a £99 annual fee. 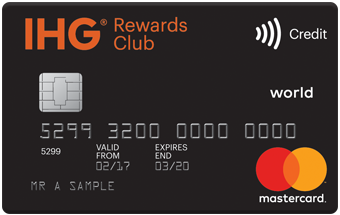 The earnings rate on the card is 2 points per £1 for general spending and 4 points per £1 for spending in IHG Rewards Club properties. You also receive 4 points per £1 on foreign currency spend which makes this card one of the most generous for overseas use. What is an IHG Rewards Club point worth? Whilst this is always hypothetical, I tend to work on the basis of a top-category hotel costing £250 – what you would pay in New York, Paris or London including tax. On that basis, an IHG Rewards Club point is worth about 0.4p based on a 60,000 or 70,000 point redemption for a room in an InterContinental in a major city. 2 points per £1, using my valuation, is equivalent to a 0.8% – 1% rebate on your spend. This is very good for a Visa or Mastercard product. How does this compare to a cashback credit card? The IHG Rewards Club Premium Mastercard is roughly twice as generous as this. However, you need to factor in the £99 annual fee. My personal view is that the IHG Premium card is very good value if you know you will spend £10,000 to trigger the free night but more marginal otherwise. The sign-up bonus is OK – roughly £80 – £100 of free hotel stays – is not to be scoffed at but is worth no more than the annual fee. Even if you don’t want to spend on the card, you may want to keep it in a drawer, unused, to continue to benefit from IHG Rewards Club Platinum Elite status for just £99 per year. You may also value the fact that the points count towards status with IHG Rewards Club. At 2 points per £1 (4 per £1 for foreign charges), a high spender will make a decent dint in the annual 75,000 point requirement for Spire Elite status. Is IHG Premium a good card to use when travelling? Yes, to the extent that you earn double points (4 per £1) on foreign spend. However, as Creation adds a 3% foreign exchange fee, you might want to get a separate free credit card to use abroad. Unfortunately there are no travel rewards card without a foreign exchange fee. One option is to get a free Curve Card – see this HFP article – and link it to a miles-earning Visa or Mastercard. American Express Membership Rewards stopped being an IHG Rewards Club partner in 2012. This means that, if you need to top-off your IHG Rewards Club account to get to a suitable level for a redemption, the credit card may offer an easy way to get the points you need. You can transfer Virgin Flying Club points to IHG Rewards Club points at a ratio of 1:1. These transfers no longer count towards status. As a sign-up bonus, 20,000 points is worth £80 – £100 of free hotel stays if used well. You will also benefit from your Platinum Elite status when you redeem your points. This is a good return on the £99 fee. If you managed to spend £10,000 on the card in a card year, in order to trigger the free night voucher, then the earning rate is attractive. After the first year, if you felt that you would spend under £10,000, it becomes less attractive unless you want the Platinum Elite status, but any regular guest at IHG hotels would value this. My personal view is that this is arguably the best Visa or Mastercard on the market for high spenders who will trigger the free night each year. The application for the IHG Rewards Club Premium Mastercard can be found here. Do you know short-haul Avios redemptions are often cheaper as 2 x one-ways? Have had no problem paying off Amex and Lloyds using curve linked to Virgin, Hilton and IHG. Has anyone tried paying off the underlying credit cards using curve and the same underlying card – eg pay off virgin mastercard by curve linked to virgin mastercard? I thought financial payments through Curve weren’t allowed? I think Curve will take a dim view of cash recycling. See their T’s & C’s. We have probably all thought of that but prefer to keep the card than be shut down. I do not have curve – just seems far too flaky, apart from my not having an android or iOS device – but why would you want to do that? Surely you would, in any case, be much safer paying off Virgin with Hilton and Hilton with Virgin?? I’d considered doing this but thought it was taking the p*ss a little too much! This is the equivalent of one night stands with financial institutions…. With one nights stands comes STDs!!!! I couldn’t stop laughing at first. You sir, have some leftfield thoughts. You are clearly a very creative thinker though ! you’ll discover other opportunities that perhaps can be exploited more discreetly . People on here been racking up loads of points and status on this one. Kept it quiet but we are all on to it now. Easy money! Anyone wanna buy any IHG points? I’ll sort you out. 0.35? Not the best time to do financial transaction right before sleep. Reading through this article, I was like, can I pay credit card bill with Curve? So I tried to pay my Lloyds Avios Duo, then only realised my Curve is linked to the same card Avios Duo!! I was like OMG. I immediately use Back in time to charge to IHG Premium, but it failed. Later I managed to back in time to charged to other cards. However, I think I might be screwed now, will see in the next few days. How do you pay off your Lloyds Avios credit card by card? thanks Guys – I’m definitely not insane and glad that some people have at least thought of it or done it – datapoints appreciated! Doubt you’ll get many here – not exactly the best topic to discuss! Perhaps just do some legwork yourself? Isn’t US card currently only giving a 40k night but going back to uncapped next year? What’s the best order to create a stay which uses the following?